Yamaha Motor Launches New Full Model Change SCARA Robot YKX Series Compatible with Advanced Robotics Automation Platform - News Releases | Yamaha Motor Co., Ltd.
IWATA, October 17, 2016—Yamaha Motor Co., Ltd. (Tokyo: 7272) announced today that it will launch the new YKX series of SCARA robots from December 1, 2016, which is compatible with the newly-developed "Advanced Robotics Automation Platform" integrated control robot system. With this full model change, the YKX series has achieved even higher rigidity and high-speed motion through drive system upgrades and Yamaha Motor's unique motor-reduction gear direct connection structure (completely beltless structure). This advancement has improved motion performance in practice while holding tools and pieces, and the 400mm-length arm model boasts the industry-fastest* standard cycle time of 0.28 seconds. The robot arm is pre-fitted with utility spaces and attachment screws in order to attach peripheral devices such as user tools, as well as having internal wiring and piping designed for a variety of usages including air devices, solenoid valves, and camera devices as standard equipment, enabling smooth introduction of this robot. Moreover, the detachable robot connection cable makes mounting of the robot itself or changing the cable length simple. The motors are complete absolute method models, making origin return unnecessary when moving the robot or at startup. Furthermore, the transition to the beltless layout and adoption of long-life grease means that the drive system is now maintenance free. In addition, the YKX series is compatible with the "Advanced Robotics Automation Platform" integrated control robot system, which enables control of multiple robot products, in order to increase space efficiency and decrease introduction costs. Through a broad product lineup and optimal performance and size to match customer needs, the YKX series flexibly and rapidly adapts to a wide range of customer applications. 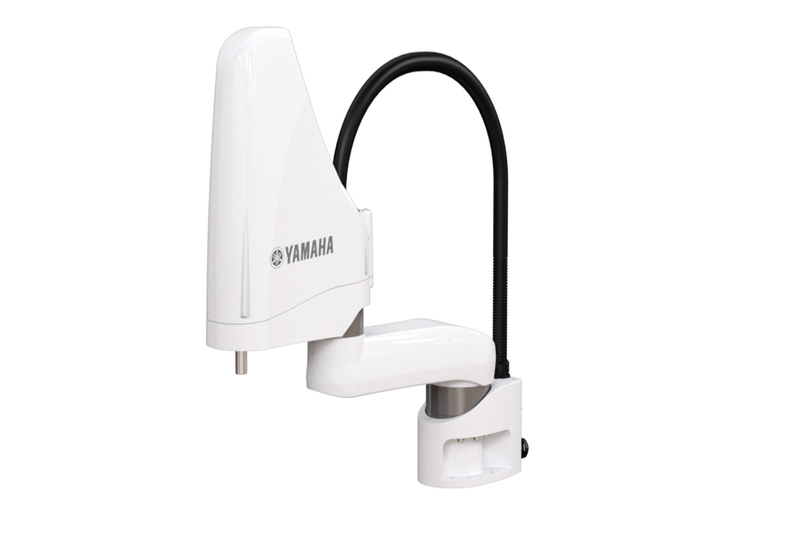 From industrial robots to controllers, Yamaha Motor's lineup of products to powerfully support the automation of production sites is rich in variation. Yamaha Motor builds on these strengths to pursue greater efficiency and quality in increasingly complex, diverse, and high-speed production sites. Among these, since beginning the manufacturing and sale of SCARA robots in 1984, Yamaha Motor has taken initiatives to pursue both lower prices and performance in terms of high speed and high-precision capability, working on the diffusion of robot products in a highly-competitive market. Through delivering the industry-fastest standard cycle time, the new YKX series responds to the ever-increasing requirements of manufacturing sites for small-scale varied production and higher speed. At the same time, overall control is possible from a single integrated controller even where multiple units are mounted, contributing to cost reductions and space efficiency increases during installation and operation. The robot arm is pre-fitted with utility spaces and attachment screws in order to secure peripheral devices such as air devices and solenoid valves. The robots feature internal wiring and piping compatible with a variety of peripheral devices such as cameras, Ethernet devices, and compact electrical devices as standard equipment. Moreover, the robot connection cable is easily detachable from the main robot unit, making work to mount the robot or change the cable length smooth. In addition, consideration is given to safety and installation adjustment, as the vertical axis brake can be released by using the brake release switch mounted on the arm. By incorporating a motor-reduction gear direct connection structure into every joint of the robot and using no belts at all, regular belt tension adjustment is not necessary, maintaining high precision over an extended period. Moreover, through utilizing long-life grease for reduction gear lubrication, regular greasing is not required. Finally, the drive motors are complete absolute method models, making origin return work unnecessary when moving the robot or at startup.